Basque rider Benat Intxausti gave the Movistar team its third stage win of the 2013 Giro d’Italia and moved himself into the top 10 on general classification after winning a three-up sprint in Ivrea on stage 16. “I want to dedicate this victory to Xavier Tondo and my gran, this is the first time I’ve been able to put my arms in the air with a win, so when I crossed the line it was for them. We’ve got a bit of a free role here in the race, but my aim is to finish in the top 10,” said the 27 year old later. Following Movistar wins for Alex Dowsett, the stage win and time in the mountains jersey of Giovanni Visconti and now this win in Ivrea, who would bet against Intxausti finishing inside the top 10? 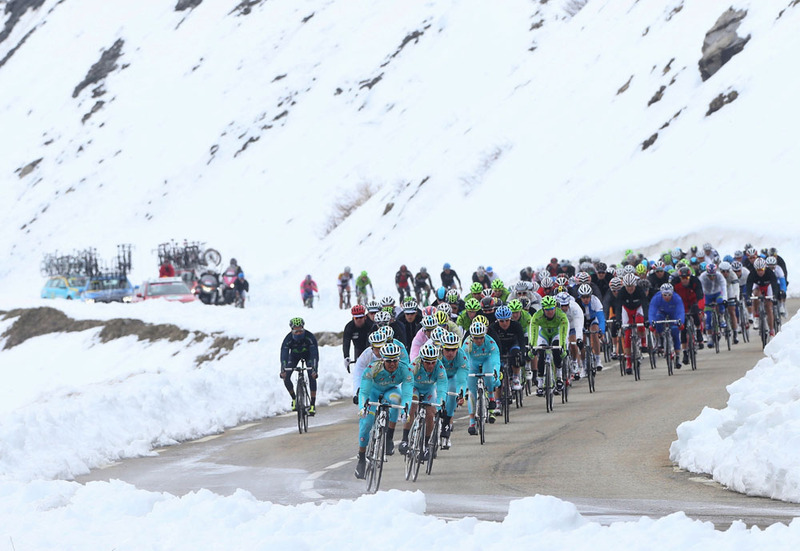 For race leader Vincenzo Nibali, it was – or appeared to be – an easy day. Such was his confidence that he gave his Astana team mate Tanel Kangert a free hand once the tricky descent off the final climb of Andrate was over. “Yes, it was good for Kangert to be in front, I was happy for him to go, partly to go for the stage win and partly, with three riders in front, to take away the time bonuses on the stage. He finished second, but that was good too. We had a good day,” said Nibali. Astana and Nibali had a good day in spite of a final 25km that was full of attacks and a second category climb at Andrate with a fast, technical descent which saw attacks from Carlos Betancur (Ag2r), Michele Scarponi (Lampre), Sammy Sanchez (Euskaltel), Rigoberto Uran (Sky) and Robert Gesink (Blanco). None of which upset Nibali who appeared at his ease. “On the descent it wasn’t that I attacked, I followed Scarponi who was chasing Sanchez and Bettancur, but only to cover the move. When he ran wide in a corner, I went through to catch up with the two leaders, it wasn’t an attack,” explained a fresh-looking Nibali later. On this stage – a 238km transition between Valloire, west towards Ivrea north east of Turin – the bunch was helped along by a three-quarter tailwind, which kept the pace high and encouraged a 22-rider break go clear before Mont Cenis after 30km. Although they had a maximum lead of 4-54 with 76km to go. Inevitably, it slowly came back, as a number of teams decided that they had a chance of a stage win, no matter what the GC players had in mind. As the race turned off the bigger roads and headed towards the 7km climb of Andrate – the summit of which was 17km from the finish line – the favourites moved to the front, anxious to avoid crashes or splits on the surprisingly steep climb and sketchy descent which was wet in places. With the remnants of the break caught with 23km to go, a few kilometres short of the summit, there were only 14 riders left at the front, including all the hitters except fourth placed Mauro Santambrogio of Vini Fantini, fourth on GC at the start of the day. On the descent and in the frantic run-in to the line there were so many attacks it was impossible to keep track. However, inside four kilometers to go Intxausti, Kangert, Lampre’s young Pole Przemyslaw Niemiec and Gesink got a gap and, as the Nibali group paused, they forged ahead to contest the stage win. Actually, three of them did as Gesink was stricken with a technical problem inside two kilometres to go and dropped behind. If Gesink didn’t have bad luck, he’d have none at all. When things are going for you – as they appear to be with Movistar and Astana – then its all good. As Intxausti celebrated, at the other end of the finishing straight, Gesink shook his head in frustration. The race jury later awarded Gesink the same time as the lead group after his Blanco team appealed. There were several notable withdrawals during the stage, including Taylor Phinney (BMC Racing) and Matt Goss (Orica-GreenEdge).